Manzela Japanese style peanuts, have a crunchy delicious coating. Manzela Japanese Style Peanuts are addictive and their crispy shell doubles the nut cruch. You won't be able to put them down. Japanese Peanuts make a great snack and they go extremely well with a cold beer! Ingredients: Peanuts, Wheat Flour, Sugar, Soy Sauce (water, glutamate, Iodized salt, brown sugar, citric acid, caramel, artificial colors FD&C Yellow No. 6 and FD&C Red No. 40. 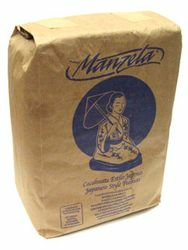 Cacahuates Manzela , es Cacahuate estilo Japones, con una cubierta crujiente. Los Cacahuates Japoneses Manzela son adictivos, no podr�s parar de comerlos! Su crujiente capa hace que el cacahuate sea doblemente crujiente. Los Cacahuates Manzela estilo Japones, se llevan muy bien con una cerveza bien fr�a!. Ingredientes: Cacahuate, Harina de Trigo, Az�car, Salsa de Soya (agua, glutamato, sal yodatada, piloncillo, �cido c�trico, caramelo, colorantes artificiales FD&C Amarillo No. 6 y Rojo No. 40. Batter fried peanuts with soy sauce very tasty. These are the exact brand I get when I go to Mexico. Cut the top of a bag add Valentina black label, fresh squeezed lime and a nice cold caguama and you're set. Manzela is the best of all the brands we have tried. My family loves these!!!! Great peanut snack. if you love peanuts, I would recommend you try this product.